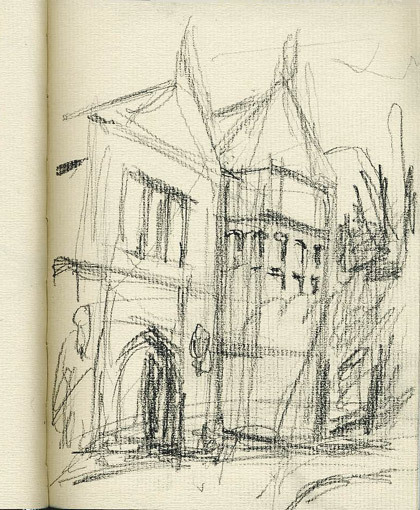 sketching about | A visual blog by the artist Peter Dickison. A visual blog by the artist Peter Dickison. This blog is moving. Things here seems to be working out well, and I like the results. So it will be continued, still as a wordpress blog, over at my website http://www.peterdickison.com. 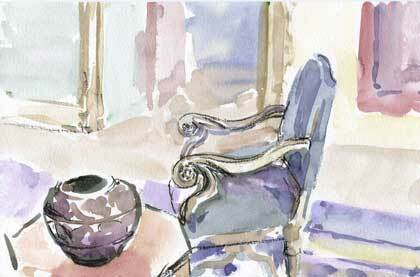 Visit an artist’s journal at to stay in touch. Pride of Baltimore II, of Baltimre, Maryland. 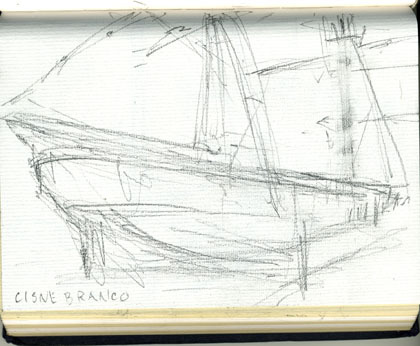 This drawing was done aboard the ship. Had to wrap up quickly as the morning crew came up to hose down and swab decks. A pretty little schooner with raked masts. Like everyone else in this town last week, I went down to the wharves to see the sailing ships arrived for the Tall Ships Festival of large sailing vessels. I had the opportunity to board a few of these ships early in the morning before anyone else was around. Most of the crew were still below decks. The few people with me were photographers, but I was wielding a pencil and sketching as usual. It was a remarkable sight, so unusual to see the very tall masts rising up to the sky, contrasting the verticality of masts and rigging against the sky, shore and sea. Years ago it was the norm to see these tall ships on our waterfronts, but we were treated to it for just a few days this summer. And I must add here that the international crews of these ships were all around town and wherever I saw them they were very friendly and a pleasure to meet. For those who haven’t seen the biggest of these ships under sail, imagine the highest suspension bridge you have seen and visualize a ship under full sail passing underneath, 4/5 the height of the center span of that bridge. 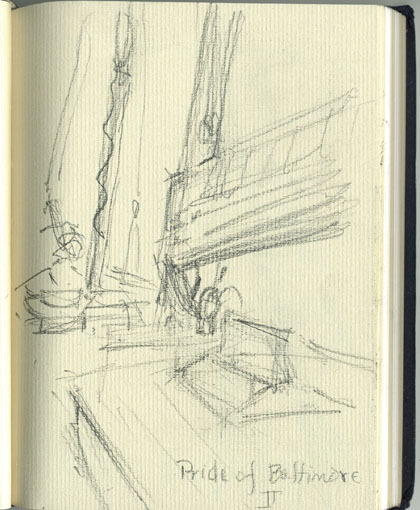 I set up a still life for drawing and painting classes with a Chinese theme: a bamboo and paper parasol, an oriental rug, pottery, an antique wooden box, a peony flower and some greenery. 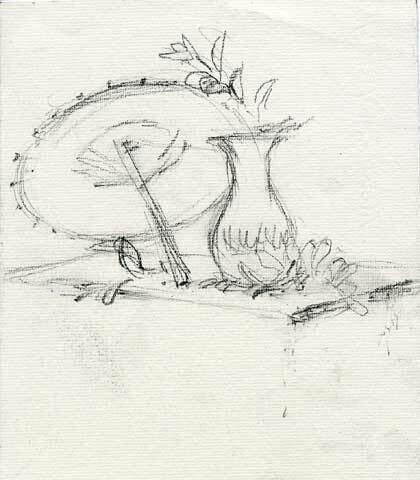 The sketch shows just a part of the still life. Back at Rough Point, the Stone House on Newport’s Cliff Walk, I have been inside the house making watercolor paintings of the interior. This ancient Chinese pottery is beautiful and covered with relief patterns that look surprisingly modern. Look up Yuan Dynasty black glazed pottery for a similar example. Beside it is a more modern western chair, English, from at least 300 years later. I am struggling to make the watercolor medium work for me. This at least got the spirit of the pottery, if little else. Yesterday I had a look inside and out of an old stone house called Rough Point, so named due to its location out on the rocky cliff of Newport, at the edge of the sea. It looks very English, and is quite large. Walking the Cliff Walk of Newport will take one right past it on the surf side. The sea was true to the name, rough breakers crashing over the rocks. The wealthy heiress Doris Duke, who lived there until the 1990’s, swam the rough waters as a routine. She also had stockade fencing, barbed wire and solid steel gates surrounding the property, and a few formidable looking dogs roaming it as well, making only distant glimpses possible until recently. It was strange at first to be there, as I remember it only as a fortress. Inside it is filled with art and unusual objects. I will return to do more drawing and painting in the coming weeks. Outdoors at Rosecliff Mansion, one of Newport’s notable summer cottages for the wealthy at the turn of the 20th century, site of lavish parties and set for the film “The Great Gatsby,” I was struck by this simple statue of putti struggling with a very mean looking dog. 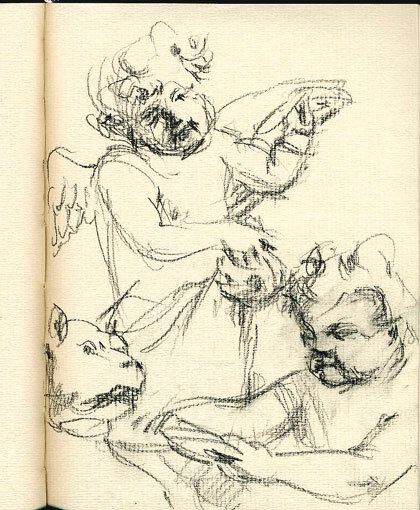 They are attempting to pull him off a third cherub who he has pinned to the ground. Is it an allegory of love conquering the beast within? I am not sure, but this struggle out in the sun overlooking the ocean made for an engaging group, all swirling about in their mythological flap. 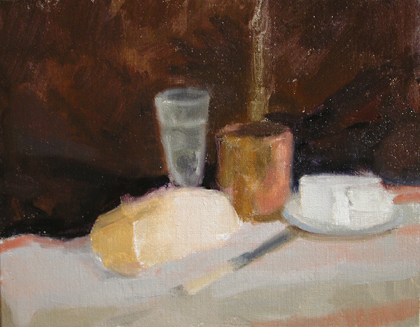 A simple Still Life of bread and cheese was the subject of this sketch in oil paint. It wasn’t meant to be more than a quick study- I ended up working for about 3 1/2 hours on it. The bread cut open is such a beautiful thing- I am passionate about good bread and pastry. I know that wheat bread is not supposed to be the best food for us, but it is a fondness that I will never tire of. Like a flower which blooms for a day, bread is good when fresh and then quickly passes. 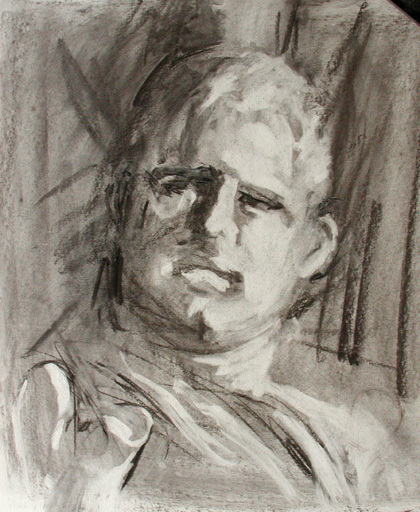 I did a drawing of a seated portrait model this week. While I do figure and portrait sketches on the sly often when in public places, doing so requires a kind of sideways study. I do not want the subject to be self conscious or uncomfortable, or to feel accosted. Having a model is a rare thing. One can look from whatever angle and stare as much as needed. 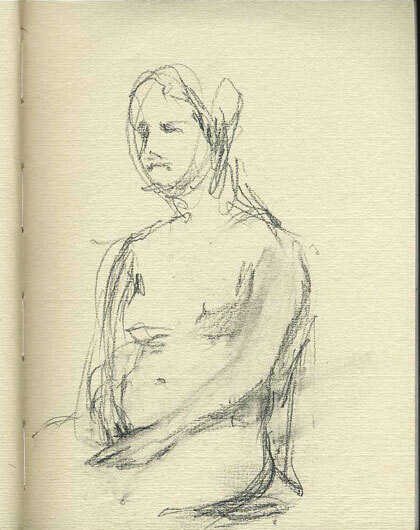 While the students were working on their paintings, I took a moment to make a few drawings of the model. Seen from below, she looked like she was in a landscape, looking out at something a distance away. Perhaps the viewer would see it differently.